I felt that the second book in Abraham’s “The Dagger and the Coin” series was a significant improvement on the first book so I was hoping the upward trajectory of the series would continue with the third book in the series. I think in some ways it was a step up with some of the best character development in the series and some of the best writing, although it does suffer slightly in comparison with “The King’s Blood” due to the lack of any single event as compelling as the revolt in Camnipol. One of the criticisms I had with the first book was that although a significant element of the world-building was that the world was inhabited by thirteen races of humanity which had been designed by their dragon overlords to have different traits we saw relatively little of the more exotic races. All of the protagonists were from the vanilla Firstborn race, with the exception of Cithrin who was half-Cinnae but had been raised in a Firstborn household and who had little connection with her heritage. Although there had been many characters from other races in the supporting cast in the previous book it isn’t until this book that they really start to play a major role in the story. While much of the first two books took place in the Antean Empire this book does seem to make more of an effort to show more of the world with Marcus and Kit journeying to the southern jungles, eastern mountains and northern tundra in an increasingly desperate attempt to find a way of fighting back against the powers of the Priesthood who have come to dominate the Antean Empire and who seem intent on conquering the rest of the world. Cithrin spends most of the book in the city of Suddapal, and Abraham does a good job of showing the contrast between the Timzinae society who make up most of the population of the city and the Firstborn societies that have been seen in earlier books. The change in culture also has an interesting effect on Cithrin’s character as the chance to see things from a different perspective does seem to assist her character development. I had thought that Cithrin’s character development had stalled a bit in “The King’s Blood” (after having been one of the best characters in the first book) but this book does give her better character development and also provides some explanation for some of her sometimes uncharacteristic behaviour in the second book. Geder has now completed his journey from sympathetic dupe to delusional tyrant and he continues to be a compelling and detestable character. One of the strengths of the series is that it does manage to make even his more extreme actions seem plausible from his (admittedly very skewed) perspective and also makes it plausible that the Antean Empire has allowed itself to be manipulated into taking part in a crusade against the blameless Timzinae. One Antean who hasn’t been manipulated into following Geder is Clara Kalliam and she gets one of the strongest plotlines in the book as she attempts to quietly undermine his rule despite her lack of resources. Fantasy novels often tend to focus on warriors or heroes with great destinies and it is refreshing to have a plotline focusing on a middle-aged woman fighting against a tyrant armed with nothing more than an in-depth knowledge of Antean society. Marcus is probably the most predictable of the protagonists, he can always be relied on to try do what he believes is the right thing (even if it isn’t necessarily wise) and he doesn’t have quite as much depth as the others but despite that he is an entertaining character to read about. The supporting cast also continue to be strong, particularly Kit and Yardem, their interactions with Marcus being a particular highlight. This is the middle book in a five book series and at times it does feel very much like a middle book, it has plenty of character development and progression in plotlines but arguably it lacks any really major events until the final chapter of the book. The final chapter does have ending which manages to be surprising despite being blatantly set up by the prologue and it does set up a potentially fascinating plotline for the later books in the series. The epilogue is also a highlight, showing things from a completely different and surprising perspective that sheds a new light on many aspects of the backstory of the world. Elsewhere, Marcus and Kit’s journey around much of the world does provide some of the highlights of the book, including an exploration of a long-abandoned temple and an amusingly anti-climatic raid on an enemy stronghold. Abraham has always been a good writer, in both this series and his “Long Price” quartet, but he has some particularly good passages in this book, often coming from Kit and Marcus’ dialogue although some of Cithrin’s conversations with Yardem and her hosts in Suddapal are also good at succinctly summarising some of the themes of the series. After a slow start “The Dagger and The Coin” has developed in a very good fantasy series. 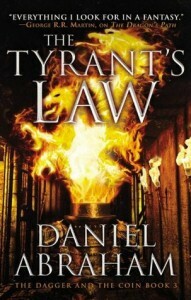 At times “The Tyrant’s Law” does feel like a lot like the middle book that it is and plot resolution will have to wait until later books in the series, but it does have some good character development and it does a good job of adding depth to the world the series is set in.